Welcome! My name is Karly Gushiken and before I start discussing who I am and the purpose of this page, I would like to say thank you for taking time out of your day to read through my work. I am currently a student at Portland State University and for my senior capstone class I was informed to partner with an organization. As you can tell, I have selected Operation Nightwatch -- a truly amazing organization. As a disclaimer, this is not Operation Nightwatch's actual website, but I am here to share with you my experience as a volunteer and how I was able to connect it to the University Studies' goals of PSU. 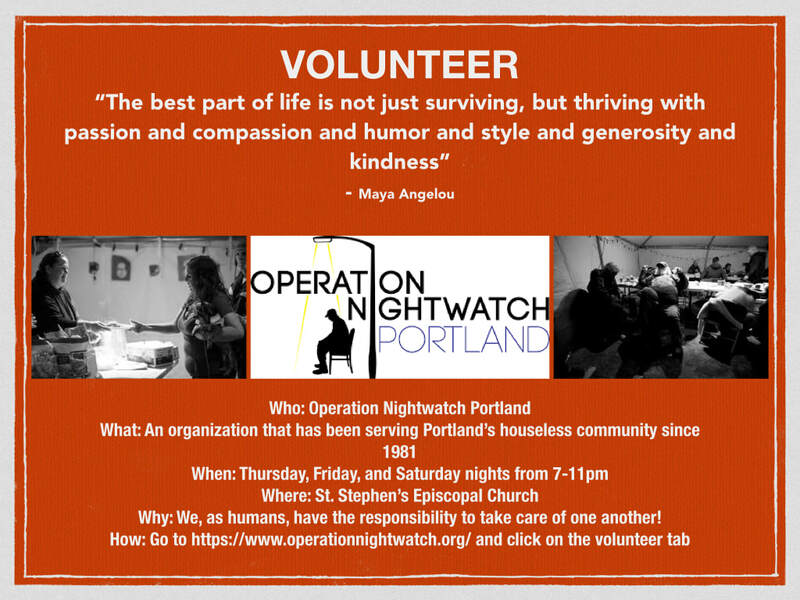 Operation Nightwatch (ONW) is a nonprofit organization that has been serving Portland's houseless community since 1981. ONW was founded by Gary Vaughan, a United Church of Christ Minister, who started this organization with a simple task and a strong initiative. One night, Vaughan gathered a handful of volunteers to walk the streets of Downtown Portland to provide basic needs and commencing amiable conversations with those living on the streets. With the help of Debbie Coppenger, who became the second executive director aside from Vaughan, Operation Nightwatch gained stability as a hospitality center that is now located at St. Stephen's Episcopal Church (downtown Portland) and Clackamas Service Center (Southeast). Operation Nightwatch supports the concept of inclusivity. ONW welcomes everyone, despite their race, religion, gender, etc. "Homelessness is perhaps the loneliest experience there is. Shunned, rejected, isolated, the homeless live most of their lives in social isolation. Whatever other things they may be struggling with besides homelessness-- e.g. Unemployment, physical disability, mental illness, or addiction-- are only magnified because they feel so terribly alone." It is quite incredible that Operation Nightwatch identifies the importance of loneliness and social interaction because it is something that lacks attention from the public eye. There lies a popular stigma that houseless people are bothersome, uneducated, and needy -- which is by far from the truth. No matter one's societal status these people should not have to beg for the basic needs that everyone should be allowed to automatically receive. ​Why did I choose ONW and what are my responsibilities that come with it? When I was a freshman in high school, I came across a similar project where I had to volunteer, reflect, and share my learnings with the class. I volunteered for an organization called Project Hawai'i, which is also a nonprofit that helps to raise funds for basic needs, educational programs, and extracurricular activities for homeless keiki (children). Due to my previous work with Project Hawai'i, it has motivated me to continue on with this journey -- being able to serve such lovely people, who just so happen to be less fortunate. Throughout my night at ONW, my responsibilities consist of monitoring the occupancy of the restrooms, handing out sandwiches, pouring coffee, and most importantly sparking conversations with the guests. It is critical that these people feel comfortable, safe, and that they know there is someone that is more than willing to lend an ear. There are no words to describe how authentic and eye-opening this organization is and what they do. It is difficult to justify any unmet needs, however, one goal I could strive for in making this organization even more efficient, is to spread awareness. Due to the fact that ONW is volunteer-based, it is significant for them to have a dependable amount of working hands. Having the resources and the PSU community, I hope to be able to inform others of this opportunity. Listed below are the four University Studies' goals and a description that elucidates its relationship to ONW and my objective of shedding light on this organization. 1. Communication: "Students will enhance their capacity to communicate in various ways--writing, graphics, numeracy, and other visual and oral means--to collaborate effectively with others in group work, and to be competent in appropriate communication technologies." As cliché as it is-- communication is key. Communication sets the foundation for every situation, and is especially helpful with the mission of Operation Nightwatch. Guests not only visit the church for food and shelter, but to have friendly conversations with people that genuinely care. It is appropriate that the volunteers know when and when not to approach certain guests, but also make sure that they are doing okay. 2. Inquiry and Critical Thinking: "Students will learn various modes of inquiry through interdisciplinary curricula--problem-posing, investigating, conceptualizing--in order to become active, self-motivated, and empowered learners." ​In class, we had formed groups and each group was designated a specific UNST goal. My group and I got Inquiry and Critical Thinking, where I learned that critical thinking is a goal-directed thinking/reflective thinking. At times, a guest(s) may cause a scene or have some sort of issue with another guest, it is important that the volunteer takes the time to contemplate on the solution of the problem and when to call a director. 3. Diversity, Equity and Social Justice: "Students will explore and analyze identify, power relationships, and social justice in historical contexts and contemporary settings from multiple perspectives." As I mentioned before, Operation Nightwatch greets all incoming guest, despite any labels. When everyone comes into the main room, there is no doubt that there is diversity -- it's an awing sight to see. In respect to equity, ONW supplies guests with items that they specifically need, like coats, pants, pads, cough drops, etc. Additionally, Portland State is an environment that acknowledges diversity, thus reaching out to students about this volunteering opportunity may be something that they would like to do. 4. Ethics and Social Responsibility: "Students will expand their understanding of the impact and value of individuals and their choices on society, both intellectually and socially, through group projects and collaboration in learning communities." As cheesy as it may sound, the world needs more kindness. We are human, these people on the streets are human, and we should lend a hand to one another because it is the right thing to do. We as a society have the responsibility to take care of one another. ​The plan to spread awareness will be exhibited with a small flyer that simplifies the mission and vision of Operation Nightwatch, along with information on where to go to signup for volunteer spots. Taking into account that my target audience is the PSU community, I will be posting this flyer on bulletin boards in buildings (Smith, Cramer, Library, etc.). ​Photograph with Kolin Busby (mental health director) and Zubaida Ula (downtown program coordinator). Reflections have always been a challenge for me because I have so much to say and I have no idea how to say it, but I will keep this short and sweet. After each night of volunteering, I am always being thanked. The directors of ONW and their guest are some of the most appreciative people I have ever met. Every night a guest would say, "Thank you so much for the work you do." Although I respond with "you're welcome," I feel as if I should not be thanked for it because I would not consider my time there as work. I love the people and the cause of this organization. As much as I have helped them, they have impacted me in more ways than they know. ONW has taught me the importance of listening. It is true that conversations rely on verbalization, but the person lending an ear also plays a major role. Listening is an element of communication that more individuals should recognize because everyone wants to feel that their thoughts and ideas are being heard. Also, I learned that the most important things in life are free -- kindness, compassion, and friendship. Being away from home, a student in college, and having big dreams... life can be very stressful. After long days, all I want to do is lock myself in my apartment, but it was not until I started volunteering at ONW, that I found a place that made the worries disappear. Although these people may have their rough days as well, they manage to continue on their night with a smile.